Today, I’m combining multiple challenges, Viva la Verve April week 1, the Free for All using mix ‘n match designer papers and I’m saluting the queen for the day, Suen. My card base is the standard A2 (4.25″ x 5.5″). Next comes a layer of beautiful designer paper from Basic Grey. Then I’ve layered some matching paper over another piece of plain card stock, then yet another layer of different coordinating paper over another piece of card stock. 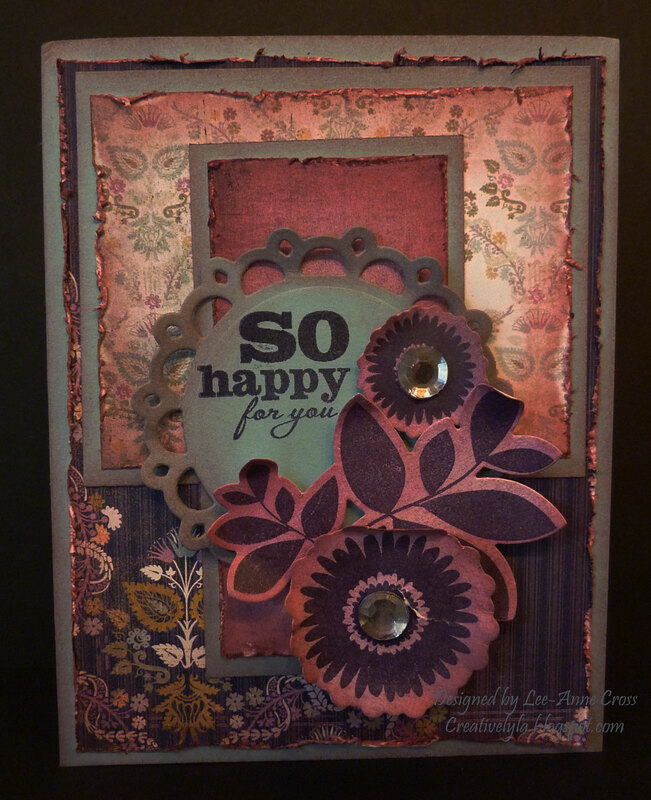 I’ve used a Spellbinder’s die for the round piece and stamped the Verve sentiment on it. Then three different Verve stamps were used for the flowers and leaves. Each was die cut with a coordinating die from Verve. There’s lots of distressing on each layer and lots of sponging too. The flowers and leaves have been shaped a bit and popped up on dimensionals for a little more interest. The only embellishments used are a couple of large rhinestones.